We could make an even trade for Canadian conservatives. When assessing the motives of migrants, the press can only seem to tell one of two stories: If they’re leaving the Third World, they’re escaping poverty; if they’re leaving the First World, they’re escaping politics. Canada has emerged as a favored backdrop for the latter sort of storytelling as of late, with any and all movements of peoples across the U.S.–Canadian border now reliably slotted into larger media narratives contrasting the supposed hell of Donald Trump’s regime with the heaven of Justin Trudeau’s. Lazy, Trump-centric characterizations of the multi-dimensional, long-running problem of American-based refugees crossing illegally into Canada is but one manifestation; another is the notion, most recently articulated in Axios and the Globe and Mail, that Canada is pulling in oodles of brilliant American expats who cannot stand another moment living under the rule of their monstrous president. Beneath the sensationalistic headlines, which brag of Canada’s “brain heist” of “scientists fleeing Trump” were stories of a handful of American professors who had accepted jobs at Canadian universities. Despite a few generically anti-American quotes from the academics rationalizing their move to Canada, the articles ultimately had to concede the less politically interesting reality that the scholars in question had been incentivized to emigrate by the Canada Research Chairs Program, a nearly two-decade-old Ottawa initiative in which Canadian universities are given grants to help recruit expensive talent from other countries. 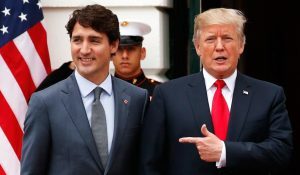 The search for high-status Americans running off to Canada has been an obsession of the press of both countries since Trump’s election, and a lack of tangible evidence has done little to temper writing on a phenomenon that many seem determined to will into existence. Such articles are easily identified by common characteristics, none of which are exactly testaments to journalistic excellence. A single compelling anecdote is often used as substitute for harder proof — as was the case with the absurdly overcovered story of a photogenic South Carolina couple who moved to Halifax — as is vague, aspirational language about this-or-that Canadian industry “looking to” exploit America’s Trump apathy. Decontextualized jumps in percentages are also a mainstay (American applications to Canadian colleges have leapt “20 to 70 per cent” bragged the head of Universities Canada), as are giddy tales of some random bureaucrat or lawyer’s website crashing. What such stories never mention, however, is just what a daunting task it is to substantially alter the directional flow of North American migrants in Canada’s favor. However cliché it may be among a certain set of liberal American to lust wistfully for a Canadian exile, in any given year significantly more Canadians “flee” in the other direction. According to the Canadian immigration department, 9,100 American citizens got permanent residency in Canada in 2017, a figure slightly higher than the 2016 total (8,410), which was itself higher than the 2015 total (7,520) but lower than the total in 2014 (8,491). 10,187 Americans got Canadian green cards in 2008, the only year of the last decade in which the figure surpassed 10,000.